When you make a gift to Creighton University School of Pharmacy and Health Professions (SPAHP) or give your time as a volunteer, you invest in the future of our School and our students. You also support Creighton’s Jesuit, Catholic mission. Creighton students and alumni are changing lives and making a difference around the world. Also consider nominating for a SPAHP award! Your direct contribution to the endowment is a gift that will “live on” forever. Your gift will help establish a new endowment fund commemorating “100 Years of Health.” While minimum support levels for endowments have been established, additional gifts to the endowment fund may be made at any time in any amount. A memorial is a contribution made in memory of a friend or loved one. A legacy allows you to contribute to Creighton without adversely affecting your financial security or that of your loved ones. One person’s gift can inspire generations to come. Regardless the size of your estate, it’s a testimony to your life, your hard work and your values and commitments. When transferred to the next generation, it can reflect your vision and goals. To be recognized as part of the Legacy Society, let the School know you’ve remembered us in your estate plans. Contact Robert Skrydlak, Assistant Director of Estate and Trust Services, at 402.280.2885 or 800.334.8794. A tribute can be made in honor of a person or group. It’s a great way to make a charitable donation in someone’s name for a special occupation or holiday or to recognize an accomplishment. Unrestricted gifts are put to immediate use supporting the School’s greatest needs – funding innovative academic initiatives, updating classrooms and laboratories and attracting and retaining respected faculty. Unrestricted gifts are especially valuable in meeting the ever-changing and unexpected challenges that arise during an academic year. Make a gift to the School of Pharmacy and Health Professions now, or continue exploring ways to give back below. 100 years ago, the Jesuit Community convened with a group of committed health care professionals to form the Creighton College of Pharmacy, with a unique and noble goal in mind: to enhance the quality of patient care. In subsequent years, commitment to this goal expanded to the areas of occupational therapy, physical therapy and emergency medical services. The School’s commitment to the goal of quality patient care continues today. As a result, people nationwide are living healthier lives thanks to the expanded role of their pharmacists, occupational therapists, physical therapists and other allied health professionals in their health care. 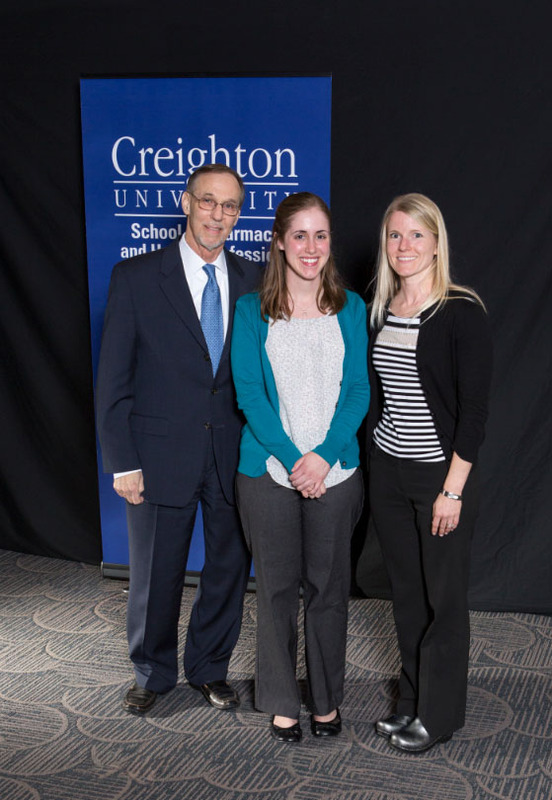 Make a personal statement about your commitment to Creighton’s goal of exceptional health care education. While much as has been achieved, much remains to be done. Merit and need-based student scholarships continue to be one of the School’s more pressing needs. In this uncertain economy when many students want to pursue professional education but financial hardships deter them, scholarship funds are desperately needed. You are invited to join with fellow alumni and health care professionals in supporting the Alumni Centennial Endowment Fund, in recognition of the work ahead. It is through your generosity that Creighton students can continue their education and pursue professional goals. The goal of the Alumni Centennial Endowment Fund is to establish a resource to help the School’s ongoing efforts to meet the ever-increasing need for student aid. The Alumni Centennial Endowment Fund is essential to the School’s ability to attract and retain quality students and to carry out the School’s mission. 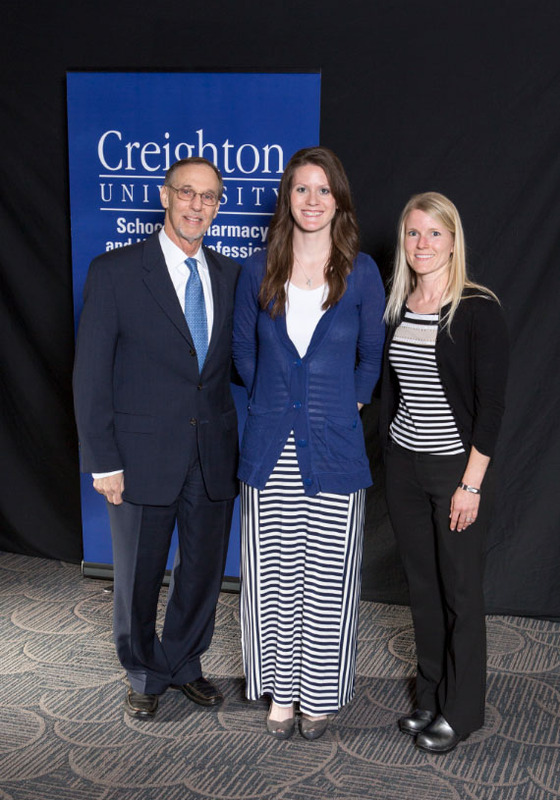 Scholarships funded through the endowment will help Creighton School of Pharmacy and Health Professions fulfill its goals of providing support for those students most in need and encouraging the growth of a more diverse student body. The rewards of enabling a student to focus on doing well in school –on their growth as a professional and their commitment to their chosen profession – instead of on financial challenges are immeasurable. Consider your professional commitment and accept the invitation to contribute to the Alumni Centennial Endowment Fund. Giving at this level, your name will be added to the Alumni Centennial Donor Walls that are displayed in the School of Pharmacy and Health Professions History Hall. The Gold Level member receives the benefits of the Silver Level; in addition you will receive a Centennial commemorative lapel pin. The distinction of membership in the Dean’s Circle is granted at the Sapphire Level and above. Recognition at this level enjoys the privileges of the Gold Level, along with the addition of a “sapphire” embedded in the lapel pin. The year you reach this level, you will also be invited to an exclusive donor appreciation event. The Ruby Level includes membership in the Dean’s Circle as well as the privileges of the Sapphire Level. Additionally, you will also receive a special lapel pin, recognized by a “ruby” jewel. The Diamond Level enjoys the privileges of the Ruby Level and will also receive our highest level of distinction by a “diamond” embedded lapel pin and a print of an artist’s rendering of the Creighton campus commissioned during the School’s Centennial Celebration. For online giving, please select “Give to the Area(s) of Your Choice” and enter SPAHP Centennial Scholarship. If remitting by check, please indicate SPAHP Centennial Scholarship in the memo. For more information about opportunities for giving or to speak with the Assistant/Associate Dean for Alumni Relations, C. Curt Barr, BSPha’74, PharmD, please contact the School at 800.325.2830 or 402.280-2950. Dedicated faculty has been instrumental in shaping your success. One such dedicated faculty member is Judy Gale. As you may know, Judy will be retiring in August after a distinguished career as both a master teacher and a master clinician. In deciding how to best celebrate her achievements and provide a lasting tribute, we listened to the many alumni and current students who speak to how richly she has touched their lives. The admiration and respect she garners is truly heartwarming. It is in that spirit that we have created as a lasting tribute : The Judith R. Gale Master Clinician Scholarship. Scholarships such as this one are essential to Creighton’s mission of preparing talented men and women for lives of professional distinction, ethical leadership and committed citizenship. The scholarship will be given annually to a third year physical therapy student who demonstrates outstanding promise to develop as a master clinician. Please spahparo [at] creighton [dot] edu (contact us) if you would like to make a gift. Marzia Puccioni Shields, Director of Development Creighton’s School of Pharmacy and Health Professions, has been working with two alumni on the creation of the Ron Hospodka Endowed Scholarship. As you may know, Ron Hospodka retired in January after more than 30 years of a distinguished career at Creighton University’s School of Pharmacy ad Health Professions. Ron has touched so many lives and in deciding how to best celebrate his achievements and provide a lasting tribute, a scholarship has been set up: The Ron Hospodka Endowed Scholarship. The admiration and respect he garners is truly remarkable. The scholarship will be given annually to a third-year pharmacy student in good academic standing who has demonstrated leadership and service. Scholarships such as this one are essential to Creighton’s mission of preparing talented men and women for lives of professional distinction, ethical leadership and committed citizenship. To make a gift online go to giving.creighton.edu select “make a gift” under “designations” please write the name of the scholarship (The Ron Hospodka Endowed Scholarship) so your gift will be allocated to the Ron Hospodka Endowed Scholarship fund or contact Marzia at marziashields [at] creighton [dot] edu or call her 402-280-3531 with any questions.